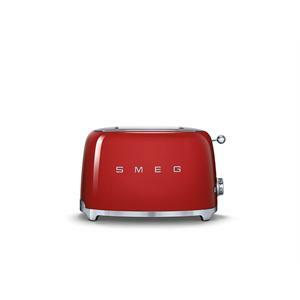 2 extra wide slots ensure that the 50s Style Toaster by Smeg is capable of toasting even large products like bagels. Get the perfect toast with 6 browning levels and modes for reheating, defrost and bagel/crumpet. Illuminated controls make it an ease to set even in the dim early morning light. The removable stainless steel crumb tray ensures that the Smeg 50s Style Toaster is easy to clean. A classic 50s Style body and design bring a old world class into your kitchen.